The history of TCIS begins more than a century ago, with the Christian missions movement. In a country and time of growth and upheaval, TCIS has endured as an institution offering high quality education for many generations. The light of the Gospel of Christ came to Korea in earnest in the late 19th century. Distinctively, protestant missionaries brought their families with them to this new frontier. Some of the earliest family names associated with Christian missions in Korea include Allen, Appenzeller, Ross, and Underwood. By 1900, Pyongyang Foreign School had opened in Pyongyang to serve the children of missionary families in Northeast China and Korea. The school provided a boarding and day school for missionary children and other foreigners. In 1916 the medical missionary family of Dr. L. Nelson Bell moved to northeast China. The family had five children, and some of them attended Pyongyang Foreign School. Ruth Bell attended PFS for three years in grades 9-11. Ms. Bell returned to the USA for her senior year and later enrolled in Wheaton College. While at Wheaton, she met and married a young man by the name of Billy Graham. Dr. Billy Graham became the most famous Protestant pastor in the 20th century. He cared deeply for the suffering people of North Korea, no doubt due to the influence of his wife, Ruth Bell Graham, who studied there during her high school years. Ruth’s sister Virginia also attended Pyongyang Foreign School. Later she married John Somerville. Dr. John and Mrs. Virginia Somerville became missionaries to South Korea and lived in Daejeon. They contributed to the founding of Tajeon Foreign School (TFS) that later became Korea Christian Academy (KCA) that later became Taejon Christian International School (TCIS). Mrs. Somerville led the effort to title the TFS/KCA/TCIS yearbook the Kulsai, the name of the yearbook at Pyongyang Foreign School (PFS). PFS students take a ride in a tank, a poignant picture representing the times. PFS closed in 1940 due to the increasing militarization of Korea. 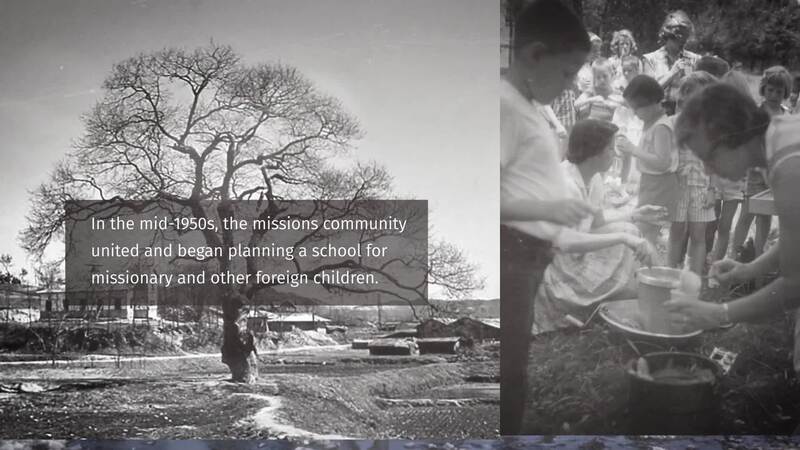 In the mid 1950s, the mission community united and requested their leaders to open a boarding school for missionary children in Korea south of the Han River. In 1958 the missions cooperatively founded Taejon Foreign School on mission property in Ojung-dong with eight primary-aged children. The next year the dormitory opened. In 1960 the school’s name changed to Korea Christian Academy. The name remained Korea Christian Academy (KCA) from 1960 until 1993 with school enrollment never fewer than 69 students and never more than 120 students. In 1993 Korea Christian Academy (KCA) became Taejon Christian International School. Dynamic changes in Daejeon and Korea contributed to the discussions resulting in the name change. In the early and mid 1990s, Daejeon experienced tremendous development as the center of science and technology research for Korea. As well, in 1989 Korea Advanced Institute for Science and Technology (KAIST) moved from Seoul to Daejeon. KAIST’s move to Daejeon clearly indicated pending growth of families seeking foreign education in Daejeon, and TCIS initiated an action plan to provide for that growth. By 1996 TCIS enrollment exceeded 200 students. However, the boarding program was still a one-dorm program with fewer than 30 students. In 1997 the school opened a second dorm and growth occurred in the boarding program. During the late 1990s and throughout the first decade of the 21st century, the school continued to develop and in 2010 reached an all time enrollment high of 639 students with 225 boarding students. In 2010 the school began the Techno Valley Campus Relocation Project. TCIS needed to relocate to a place where it could accommodate its growth and be in the middle of the growth that Daejeon as a city was experiencing. In partnership with Daejeon Metropolitan City, the newly established TCIS Korean Christian leadership and investors successfully finalized the relocation of the entire school to this campus in September 2012. The new TCIS Board of Trustees remains fully committed to the same mission and focus for TCIS that the original founding missions established over 100 years ago. TCIS continues to share the light of the Gospel and to support other Christian organizations through education with the same mission and vision. TCIS honors and carries the traditions of PFS, TFS, and KCA into the 21st century. The goal is to provide high quality international education for primary and secondary students throughout Korea and Asia, including children of Christian missionaries and ministers. In recent years, TCIS has distinguished itself in the area of Christian education. We not only provide a good education but an exceptional education, consistently producing students of exceeding success, matriculating to the top universities in the US, Korea and around the world. The school delivers that education with dedication to Christian principles from teachers, dorm staff, and support staff in a passionate and humble manner. From its inception, TCIS has proven itself to be a school that is always moving forward in educational programs and in its mission to grow the Kingdom of God.